Five star review of Two Fearsome Fairy Tales in Good Reading! 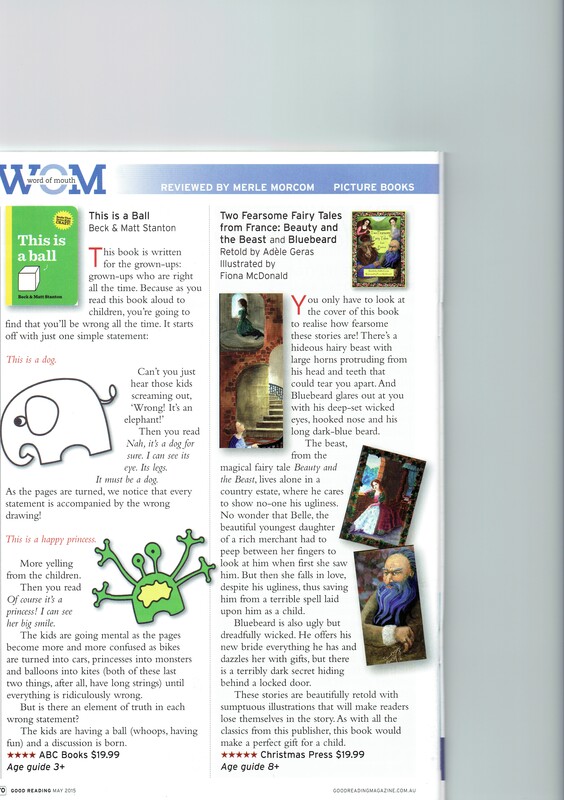 A fantastic five star review of Two Fearsome Fairy Tales from France has appeared in the May issue of Good Reading. We are very proud! It was a rainy afternoon in Armidale on Saturday May 2, but that didn’t deter the lively crowd of Christmas Press friends and supporters who turned out to help us celebrate the launch of our newest title, Adèle Geras’ and Fiona McDonald’s beautiful Two Fearsome Fairy Tales from France. The launch was held in the congenial surroundings of Fiona’s fabulous toyshop, Granny Fi’s Toy Cupboard, and Fiona herself was present to sign books and Adèle couldn’t of course be there–she lives in Cambridge, UK–she sent her best wishes from abroad. Christmas Press co-director, author Sophie Masson, launched the book, pointing out that it’s the first of our titles to be written by an international author, introducing the stories and talking about the process of publishing, and showing the enthusiastic crowd the five star review of the book that appeared in the May issue of Good Reading magazine. Fiona then spoke about her experience of creating the beautiful illustrations, and also paid tribute to designer David Allan and editor Beattie Alvarez. Then it was time for chat and refreshments and book signings! It was a great afternoon. Thank you to all who came.